(2) Medical Staff, Juventus FC, Turin, Italy. Gastric intestinal, skeletal muscle and neurological symptoms are just some of the possible effects of alimentary sensitivities that may represent a risk for one’s health and may frustrate the athlete’s sport practice benefits and thwart the performance. The immunological sensitivity recovery and the re-establishment of a normal diet are generally reached by means of strict dietetic schemes (a turnover or elimination diet) requiring a strong effort into changing one’s diet habit. In the elite soccer, an intense competitive schedule including long transfers, represents another risk to these dietetic therapies fulfilment that may even worsen the symptomatology once the allergens responsible for the sensivities are again within the diet. To objectively estimate a food sensitivity in elite soccer players who have food sensitivity symptoms, by arranging a nutritional plan for the immunological sensitivity recovery, the symptomatology improvement and to test the effectiveness in terms of nutritional situation by means of the BIVA, assuming a close relation among food sensitivities, inflammatory reactions and nutritional status. Table 1. Distribution of body composition parameters over time of sample (n=8). BMI = body mass index ; T0, T1 = before and after nutritional therapy; T1-T0 = change in parameters after nutritional therapy. t = Student’s t test for paired data. 8 male 32.5 ± 1.9 years old soccer players and BMI 24.9 ± 1.1 (Average ± SD) with symptoms of possible food intolerance (gastralgia, headache, intestinal meteorism, diarrhoea, constipation, nausea) of an Italian Serie A soccer team were subjected to the Alcat Test (IMGeP, Milan, Italy) before and after 8 months of a personalized nutritional treatment. The athletes body composition was basally valued and at the end of the BIVA analysis (50 kHz, BIA 101 RJL, Akern Bioresearch, Florence, Italy). The athletes tested, with food sensitivity symptoms, were Alcat Test variously positive. The personalized nutritional treatment based on moderation rather than on drastic elimination of reactive foods and complying with the specific nutritional needs of the elite soccer player led to a nearly complete resolution of the first symptoms as the clinical evaluation and the post-treatment Alcat Test results demonstrate. Parallel to these results a significant shift of the mean impedance vector was observed (Hotelling T2 test, p < 0.0001), so indicating a more favourable condition of the soft tissues (hydration and/or mass) with no BMI variation (p > 0.05). Figure 1. Results of Alcat Test before (A) and after (B) nutritional intervention. Test results are divided into four distinct colored areas: green (no intolerant reaction), yellow (mild reaction), orange (strong reaction) and red (severe reaction). Note the reduction of food sensitivity after treatment. Figure 2. Impedance vector displacements with their 95% confidence ellipses. Impedance vector displacements (arrow) after nutritional therapy (T1-T0) with their 95% confidence ellipses. 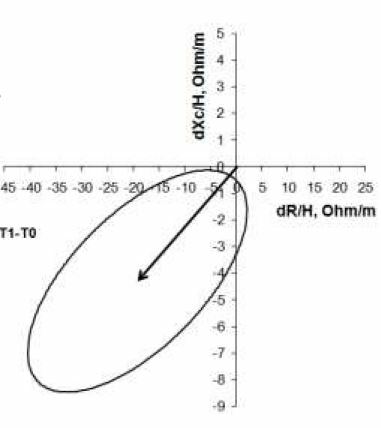 R is resistance, Xc reactance, H height, and d difference compared to T0. The Alcat Test seems to be able to detect the food sensitive reactions when it is applied to patients with initial specific symptoms. A personalized and flexible nutritional therapy based on moderation and rational elimination of reactive foods seems to be working and be suitable for the elite athlete whose specific logistic necessities (for example long travels) discourage the classic dietary regime. An efficient handling of the food sensitivities seems to lead to a nutritional condition improvement, may be reducing the concerned inflammatory situation as observed in body composition changing, that may influence the sports performance.